Middle school students from across the Houston area learned tips on how to recognize and respond to bullying at the 2017 Beau and Abe Merfish No Place for Hate Youth Summit at the University of Houston Law Center. 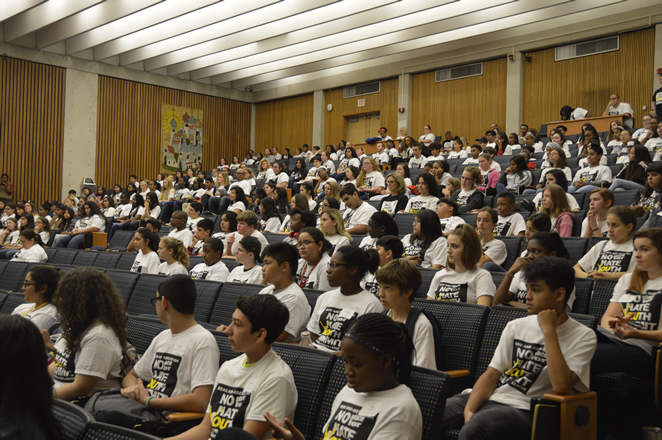 Nov. 20, 2017 — More than 300 middle school students and 60 educators from eight school districts and 32 schools vowed to take a stand against intolerance at the 2017 Beau and Abe Merfish No Place For Hate Youth Summit at the University of Houston Law Center. It marked the second year that the ADL and Law Center joined forces to host this event. "Hate is a destructive force and goes against our better nature as human beings," Dayan Gross, regional director of the Anti-Defamation League Southwest Region, said in a statement. "Everyone should be treated fairly, equally and with respect, irrespective of their gender, religion, race, immigrant status or sexual orientation. "In today's climate of escalating level of hate towards minorities, ADL plays a critical role where students and teachers can envision a more respectful America and break down stereotypes before they become a source of hatred." "I am proud of the Law Center for being able to host this event for the second straight year and spread the important message of standing up to hate," Dean Leonard M. Baynes said. "The Law Center embraces all aspects of diversity, and bullying and prejudices go against the values bestowed upon the legal profession." After an introduction in Krost Hall, students broke into groups throughout the Law Center to further develop skills to identify and interrupt bullying on their respective campuses. Sponsors included the Fund for the Future of the ADL Southwest, Rochelle, Alan, Julie and Scott Jacobson, University of Houston Law Center, University of Houston School of Social Work, and Jason's Deli. The ADL's partners in the Youth Summit were Baker Botts, the H-E-B Tournament of Champions, the Houston Rockets, Vinson and Elkins LLP and Sysco among others.